The Mutiny on the Bounty has become a famous story, leading to many books, movies, and songs. The HMS Bounty was a small, three masted, fully rigged, sailing ship. The Bounty became famous when the crew (seamen) mutinied (took over) the ship on 28 April 1789. The captain of the Bounty was named William Bligh. The ship was built in Hull, England in 1784 and was first called Bethia. In 1787 the ship was rebuilt to carry breadfruit trees. Heat and water were added to the cabins so the trees would survive in cold weather. The British government was hoping the breadfruit trees growing wild in Tahiti could be grown in Jamaica. This would provide cheap food for the slaves working on the sugar farms. The ship was very small - 90 feet 10 inches (27.7 metres) long and 24 feet 4 inches (7.4 metres) wide. The tallest mast was 53 feet (16.1 metres) high. The Bounty was captained by Lieutenant William Bligh and he took command on 16 August 1787. On 23 December, 1787, Bounty set off on the long trip to Tahiti. On the journey, William Bligh tried to go around Cape Horn. He tried for over a month but bad weather and winds stopped the ship. The Bounty was turned around and went the longer way around the Cape of Good Hope. The Bounty reached Tahiti on 25 October 1788. She had been at sea for ten months. The crew stayed for five months and lived on the island. They collected 1015 breadfruit plants. The crew were very happy living in Tahiti and Fletcher Christian fell in love with a Tahitian girl named Maimiti. They did not want to have another long journey and go back to England. The Bounty left Tahiti on 4 April 1789, on the way to Jamaica. On 28 April, near the Friendly Islands, Fletcher Christian led the mutiny (take over). Bligh and 18 sailors were left at sea in a small boat, while Christian and the Bounty went back to Tahiti. Christian and a small group of sailors, 11 Tahitian women, and 6 Tahitian men then went to the remote Pitcairn Island. After they arrived they took everything they could from the ship. A sailor called Matthew Quintal, burned and destroyed the Bounty on 23 January 1790. Pitcairn Island is a remote island in the Pacific Ocean. The Polynesians knew about the island and people had once lived there. There was nobody living on Pitcairn when it was discovered by an English sailor, Philip Carteret on 2 July 1767. He made a mistake and marked it on the map 200 miles from its real location. The people from the Bounty had the remote island to themselves. There was a lot of fighting between the new settlers. Fletcher Christian, 4 other mutineers and all 6 of the Tahitian men were killed. One of the 4 surviving mutineers fell off a cliff while drunk. Matthew Quintal was killed by the remaining 2 mutineers after he attacked them. When the American seal-hunting ship Topaz visited the island in 1808 they found only 1 mutineer, John Adams, still alive along with 9 Tahitian women. In 1856, the British government moved all the island people to Norfolk Island. Most stayed on Norfolk, but about 22 people found their way back and their descendants still live on Pitcairn. Norfolk has about 1000 Bounty descendants, which is about half its population. Lieutenant William Bligh was able to sail the small boat 6500 km back to Batavia. 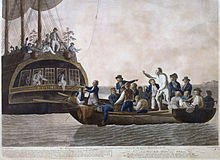 He returned to England and reported the mutiny to the Admiralty on 15 March 1790. On 7 November 1790, HMS Pandora was sent to Tahiti look for the Bounty and to bring back the mutineers for punishment. The Pandora was able to capture the mutineers left on Tahiti, but could find no sign of the group that was hiding on Pitcairn. The Pandora was wrecked on the way back to England. The following list tells what happened to the crew of the Bounty. James Morrison, boatswain’s mate, found guilty but pardoned. This map shows the journey of HMS Bounty. 3. Visits the island of Palmerston. 4. Visits the island of Tofua. 5. The mutiny, 28 April 1789. 6. Tubai, then back to Tahiti 7 July 1789. 7. Back to Tubai, 16 July 1789. 8. Return to Tahiti 22 September 1789, and leave the next day. 9. Visit the island of Tongatabu, 15 November 1789. 10. Arrive Pitcairn Island 15 January 1790. The Bounty burned 23 January 1790. ↑ "Pitcairn and Norfolk Genealogy". Retrieved 2008-07-25. ↑ "Bounty's Crew Encyclopedia" (html). Pitcairn Islands Study Center. Retrieved 2008-07-25.